Winter weather has arrived in Sweden and winter time makes for the coziest kitchen gatherings. Isn’t this true just about everywhere in the world? When the temperature falls, the winds blow and snow falls, people gravitate to the heart of the home for good company, good times and good old fashion comfort food. 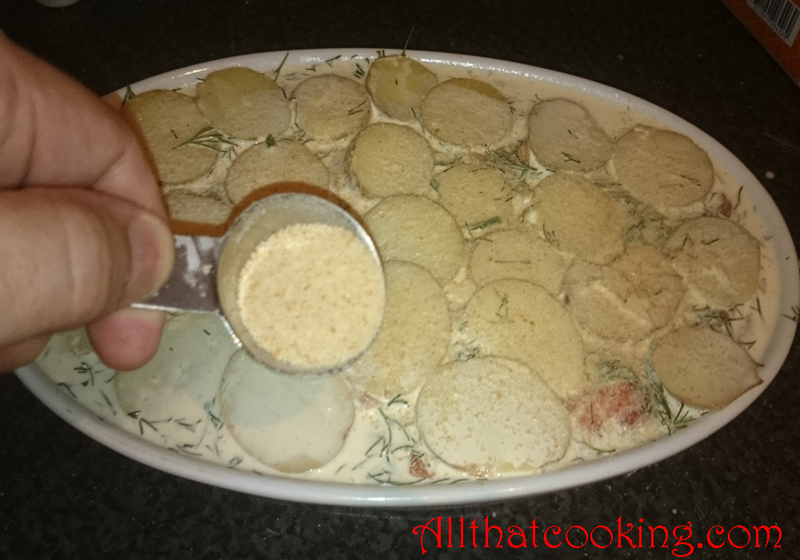 Today Oli shares a simple recipe that just happens to be Swedish “husmannskost” (comfort food) at its best. 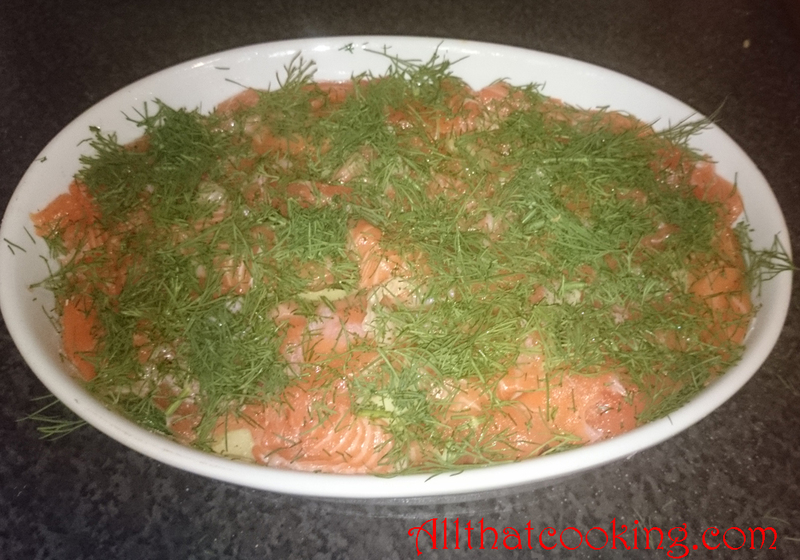 Lax pudding (as in lox/salmon) was traditionally a way to use leftover salmon and potatoes. Now it’s a popular dish found on restaurant lunch menus throughout Sweden. There are even gourmet versions on some dinner menus. 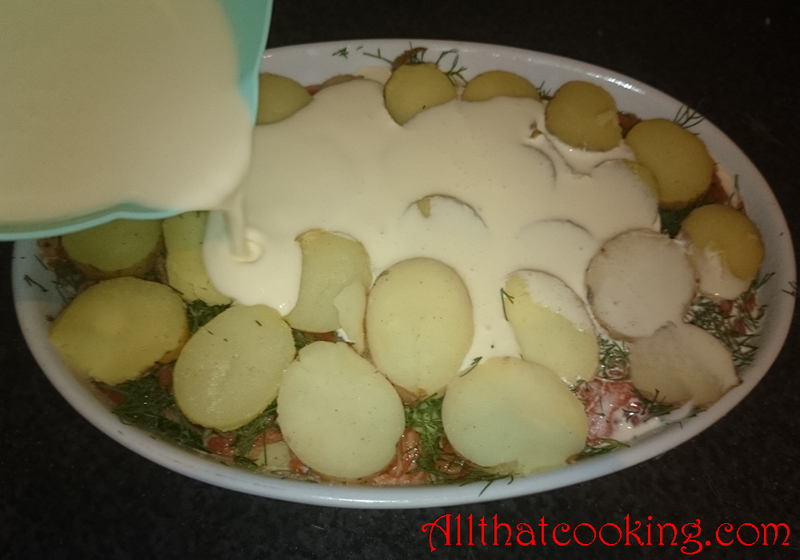 It’s very simple to make, just layer salmon and boiled potato slices, add some dill, salt and pepper and douse the whole thing with and egg and cream mixture (that’s where the pudding comes from) and pop it into the oven. It’s a delightful dish that will have tempting aromas of comfort food wafting about in your kitchen. No leftovers? No worries. Any type of salmon will do. If you are looking for something quick and easy for the holidays I think lax pudding would be a fabulous brunch dish and make a great addition to a Christmas or New Year’s buffet table. We invite you to gather with family in your kitchen and make this ultra satisfying Swedish lax pudding. 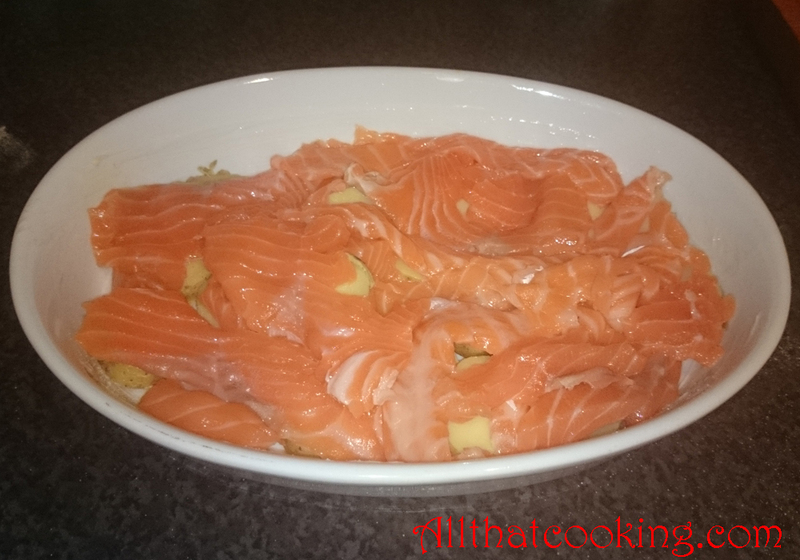 You can use smoked salmon, cured salmon or fresh salmon. But if you use cured or smoked be careful with the salt. Many Swedish cooks use finely chopped onion between the layers but Oli prefers not to. We’ll leave that up to you. Make sure that the first and the last layers are potatoes. Lightly salt and pepper each potato and salmon layer. Freshly cracked white pepper is the preferred choice. You can prepare this dish, minus the egg/cream mixture, earlier the same day or even the day before serving. 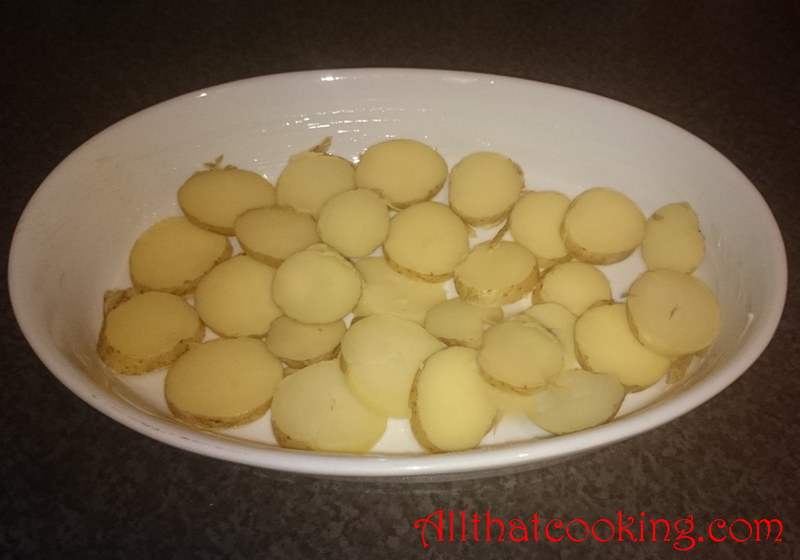 Whisk the eggs and cream and pour it over the casserole just before you pop it into the preheated oven. 1. Butter an 8 cup baking dish. 3. 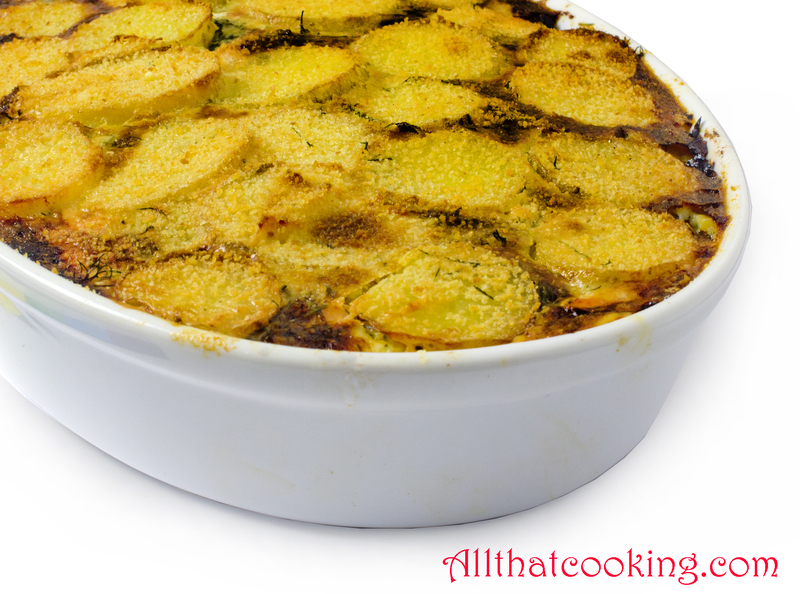 Arrange one-third of the potatoes in the bottom of the baking dish. Lightly salt and pepper. 4. 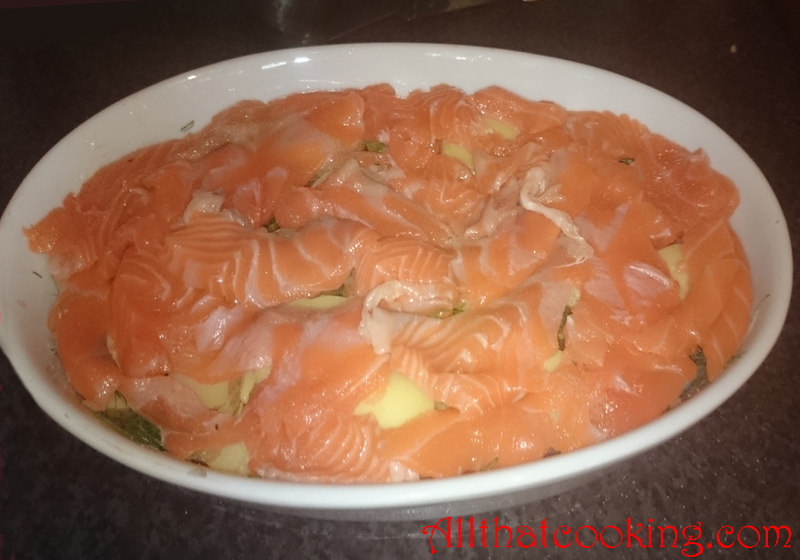 Top with half of the salmon. 5. 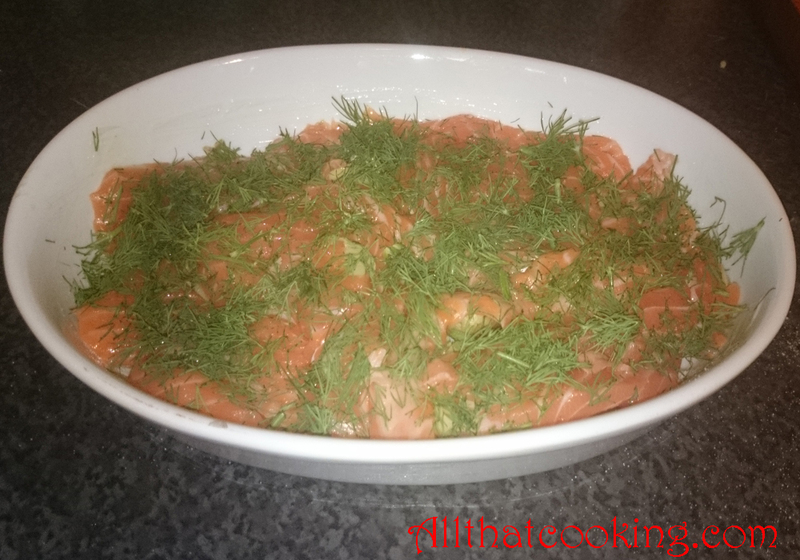 Cover salmon with half of the dill and use half of the remaining potatoes to make the next layer. Lightly salt and pepper. 6. Top with remaining salmon and lightly salt and pepper. Sprinkle with remaining dill. 7. At last place the remaining potatoes on top and lightly salt and pepper. 8. In a medium size bowl whisk eggs and cream together. Carefully pour over the casserole. 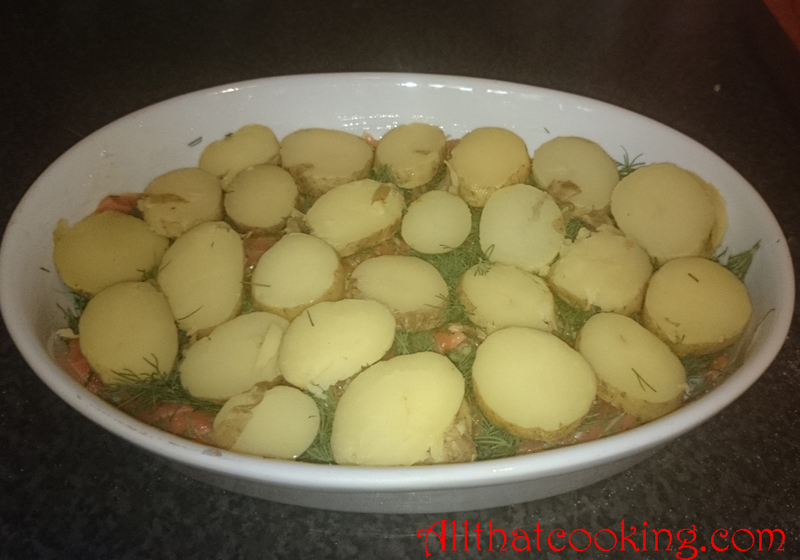 Use a fork to help the liquid through the potato and salmon layers. 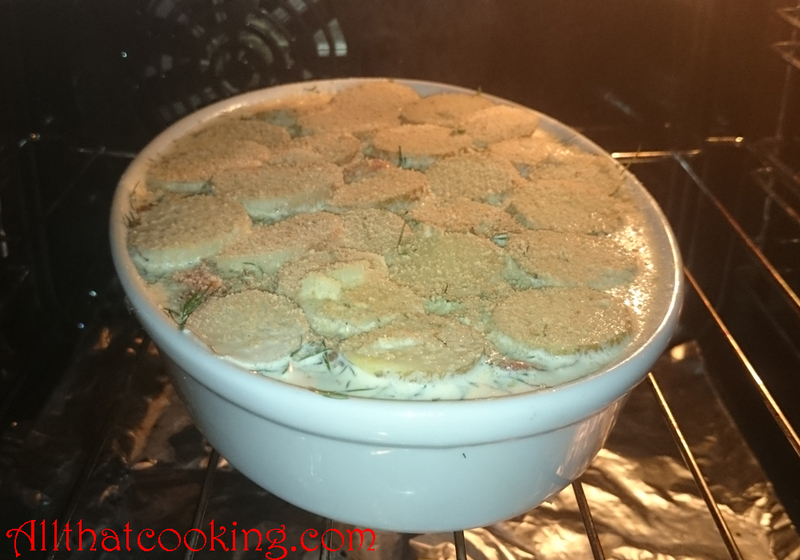 Just put the fork into a couple of places in the casserole and jiggle it a bit so that you make room for the liquid to reach the bottom layer. 9. If you are using bread crumbs now is the time to sprinkle them on top. Bake 45-50 minutes or until the top is golden. Traditionally melted butter is served on the side. 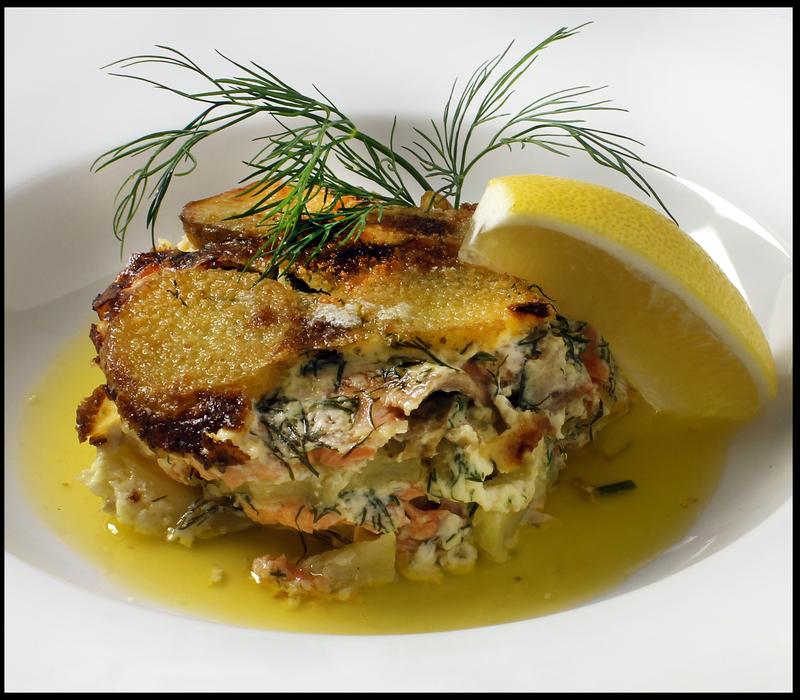 When serving you can top each portion with a bit of dill and a spritz of lemon. A crisp, green salad and some rye bread make for great accompaniments. 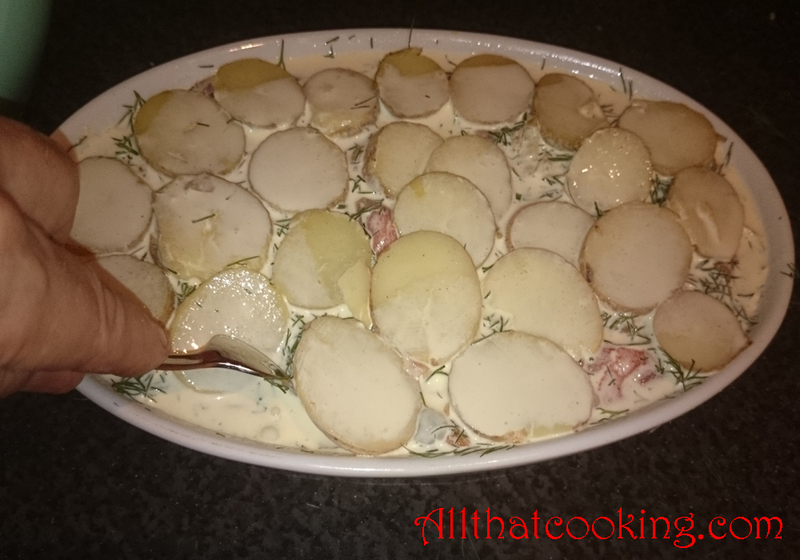 Gallery | This entry was posted in Main Dishes, Swedish Classic and tagged comfort food, salmon and potato casserole, svensk husmannskost, Swedish Classic, Swedish comfort food, Swedish lax pudding. Bookmark the permalink. This looks beyond delicious! The potato topping has turned out so gorgeously golden.